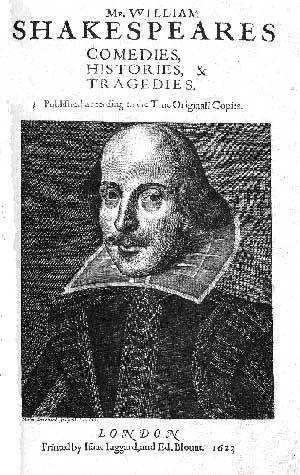 There has been much 'throwing about of brains' as to who wrote the Shakespeare plays and, in particular, The Tragedy of Hamlet, Prince of Denmark. I have often pondered the following information on the symbolism of heraldry used in Act II, scene ii of Hamlet and contemplated the heraldry of Bacon and the heraldry of Shaksper. I offer this as my own observations and have otherwise seen nothing of it. See if you can draw these various pieces together. Perhaps you will see other symbolism within the text that alludes to the author's true identity. Maybe it's much ado about nothing. "Or, on a bend sable, a tilting spear of the field headed argent." Contemporary translation: Gold, on a diagonal black, a tilting spear, color of the field [gold] tipped white. ['milky']. A speare's purpose is to shed blood. "...that he and they may bear two several coates of arms quarterly as followeth:--- The first for Bacon, gules on a chief silver, two mullets sables. The second for Quapladde Barrey of six pieces, gold and azure, a bend gules."  Grant made to Sir Nicholas Bacon "Feb. 22, 1568, by G. Dethick, Garter Principall King of Armes"
The Coat of Arms above left appears in the frontispiece of Sir Francis Bacon's Instauratio Magna of 1620. Bacon: "gules on a chief argent 2 mullets pierced sable." gules = red; chief = top; argent = white; sable = black. I am but mad north-north-west: when the wind is outherly I know a hawk from a handsaw. I will prophesy he comes to tell me of the players; mark it.—You say right, sir: o' Monday morning; 'twas so indeed. The best actors in the world, either for tragedy, comedy,history, pastoral, pastoral-comical, historical-pastoral,tragical-historical, tragical-comical-historical-pastoral, scene individable, or poem unlimited: Seneca cannot be too heavy nor Plautus too light. For the law of writ and the liberty, these are the only men. Why-- 'As by lot, God wot,' and then, you know, 'It came to pass, as most like it was--' The first row of the pious chanson will show you more; for look where my abridgment comes. You are welcome, masters; welcome, all:--I am glad to see thee well.--welcome, good friends.--O, my old friend! Thy face is valanc'd since I saw thee last; comest thou to beard me in Denmark?--What, my young lady and mistress! By'r lady, your ladyship is nearer to heaven than when I saw you last, by the altitude of a chopine. Pray God, your voice, like a piece of uncurrent gold, be not cracked within the ring.--Masters, you are all welcome. We'll e'en to't like French falconers, fly at anything we see: we'll have a speech straight: come, give us a taste of your quality: come, a passionate speech. [So, proceed you.] 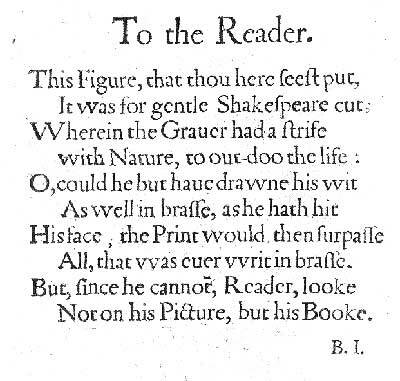 This line is not in the 1623 FF of Works. [adorned or painted] Bacon Coat of Arms here to show how an inversion greatly mimics the text itself. "Gules" [red] lies between "head to foot" and "horridly trick'd"
 thus, the 180-degree inversion. "quoted speech" is 13 lines long in original folio. Note that the "VV" that appears conspicouously close to "Carbuncles" in the 12th line of the speech is the only VV on the page. All the rest (more than 20 of 'em) are ordinary uppercase "W's." In that single half-line appears: VV i C.
In Roman Numerals V+V+I+C=111. Wow! Chance, indeed. Dost thou hear me, old friend? Can you play 'The Murder of Gonzago'? Ay, so, God b' wi' ye! Now I am alone. O, what a rogue and peasant slave am I! Confound the ignorant, and amaze, indeed, The very faculties of eyes and ears. A damn'd defeat was made. Am I a coward? Who calls me villain? breaks my pate across? With this slave's offal: bloody, bawdy villain! Remorseless, treacherous, lecherous, kindless villain! the play's the thing Wherein I'll catch the conscience of the king . And also recall the familiar -- but mysterious -- placement of "shake" and "spear" within the KJV text of Psalm 46 in the final 1611 edit. Click Here for Alfred Dodd's Numerological Cypher Chart. Francis Bacon's artful cryptographic design?  or random numerological cooincidence?  Francis Bacon of Tupelo Mississippi. This is so remarkably simple, I’m amazed that it hasn’t been seen before.  But then maybe, that was the author’s intent. To the Reader. To the Reader. All,that vvas euer vvrit in braffe. All,that was ever writ in brass. Noton his Picture, but his booke. Not on his Picture, but his book. 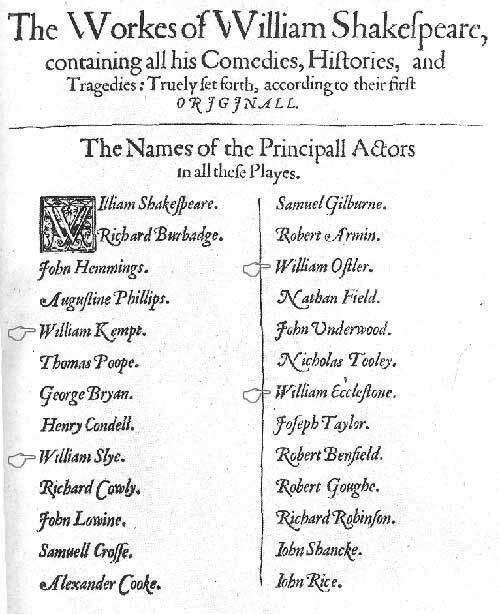 Note that in both cases, William Shakespeare’s name, as typeset in the first folio of 1623 used the double-“V” ligature for the letter “W” Note too, that other words in the text used a standard ‘W’ – so it was available for proper use. It seems, as if by choice -- that it wasn’t. Now what, in the Queen’s English, is the big mystery to that?  My illumined version of the same image. "FRom the moft able,to him that can but fpell: There you are number'd." Doesn't that phrase possibly carry a bit more meaning in light of the above discovery? And  oddly enough  it fits the alleged profiles of both men's literary capabilities. Be sure to read the two pages under "Simple Arithmatic in Elizabethan Literature" by Alfred Dodd at the Cypher Chart link. And this one is pretty much a stretch  but I thought I'd include it anyway. FRANCIS BACON in Simple Cypher =100. 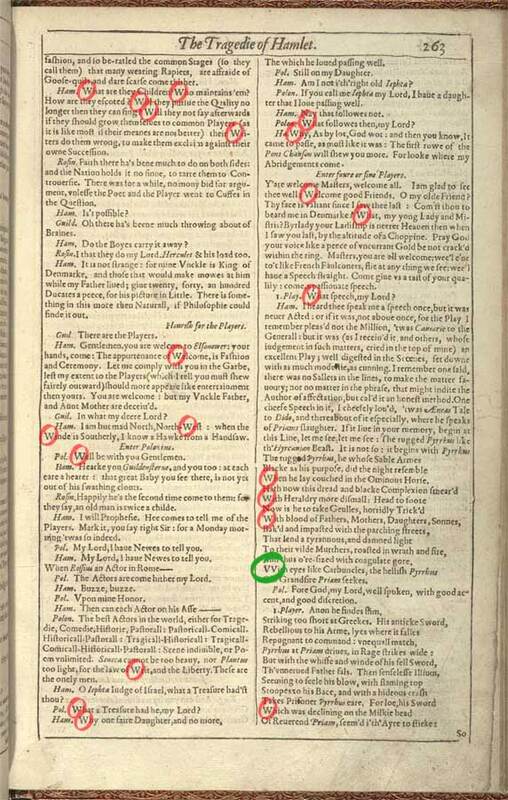 As noted in red above, there are nine double-v's and ten over-sized commas in the original copy.  Bard: A covering of fat bacon to render more flavor.